Amanda and Courtney had a daring, bold, fun, and exciting engagement session. We started at Sarah P. Duke Gardens, then, with Courtney's direction we added a twist to the end of their engagement shoot. A week or so before this session, Courtney emailed to inform me that she would have a surprise for Amanda at the end of their engagement photo shoot at Duke University. I was so excited receiving this. Clients personalizing and adding a flair of creativity to their shoots always brightens my day (and my job). As a loyal and dedicated Starwars fan, she wanted an epic lightsaber battle to close the classic outdoor session at Sarah P. Duke Gardens. With such a stark contrast in creativity, it initially presented a problem. The Starwars battle required a very different backdrop than the soft, beautiful colors of the gardens. While I loved the daringness and creativity, I needed a plan to execute this awesome idea. For the background, we found a dark, cool, concrete tunnel where the two could duel with their lightsabers. The result was this collection of images that would have even made Luke Skywalker a bit nervous. This allowed them to get brighter engagement style photos at the Sarah P. Duke Gardens and still have their fun on the dark side. 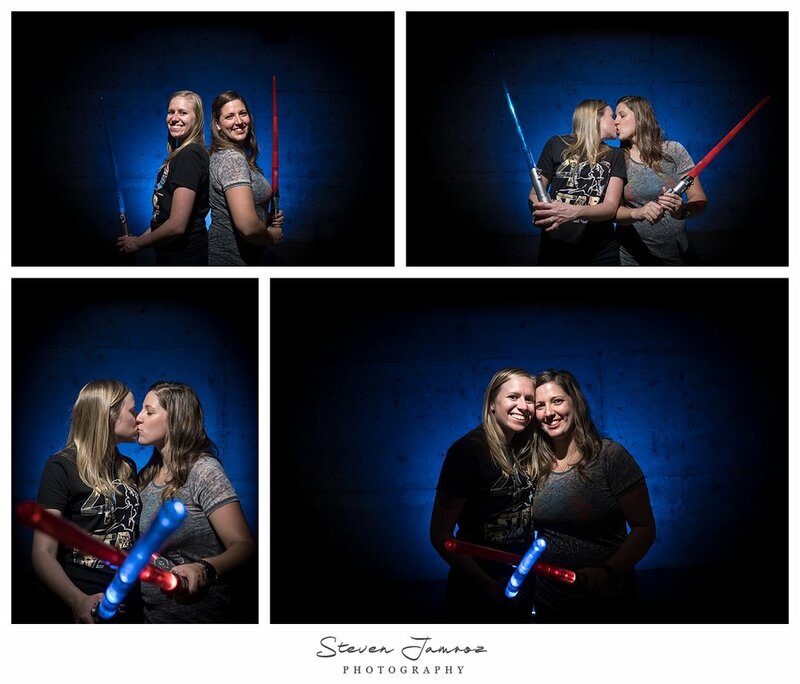 This lightsaber battle engagement session has definitely been one of my favorites to photograph. With just a little bit of exploring and lightsabers, it goes to show any (most) problems can be solved. Amanda and Courtney are just as much fun (and creative) as they seem! I'm so grateful to be able to photograph such creative and unique people. When you're having fun with a splash of creativity with your shoot, it makes my job more fun and allows me to get more creative, as well. Thank you so much to you both! I'm definitely looking forward to your wedding. Hopefully, there will be a continuing saga of the lightsaber fight there. Do you have a creative idea for your engagement photo session like Amanda and Courtney? Contact the studio today.